The Forte was the perfect venue for our daughter’s wedding! Nick and the rest of the staff were great to work with from beginning to end. They ran the reception seamlessly and we were able to enjoy the evening and not worry about anything! I would highly recommend the Forte! Thank you for taking the time to share how your experience was with Baratta's & Forte. It was a absolute pleasure working with both families on such a special day. Stress free planning with great results! Nick and the staff at Forte made for an easy planning process in my dream wedding! The venue has a beautiful view of downtown Des Moines and the proximity to the hotels was a huge benefit to our guests. We received many compliments about the food and service found at Forte! I couldn't have asked for a better experience. We worked with Nick at Forte and he was so enthusiastic, thorough, professional and so helpful. Forte has beautiful views of downtown! Although it’s large enough to host many friends and family, it has a very warm and inviting feel. We worked with Nick who answered all our questions, calmed our nerves and offered many creative solutions for our vision. We would highly recommend Forte for your wedding....we received countless comments on how beautiful everything looked and we couldn’t be happier! Thank you for the kind words, I enjoyed working with you in helping to make this a very special day for Jake & Katie. Hope you have a great holiday season and very Merry Christmas. From the very beginning, Nick was fun, pleasant, and most importantly straight forward. We felt we got competitive pricing and exceedingly high quality and service. There was plenty of space for our guests (200+), parking was great considering event space is downtown. Bathrooms were spacious and clean. Food was amazing. Event space is pretty and did not need a lot of additional decorations. The windows added a great design detail to the space. We couldn’t be happier that we chose to have our wedding reception at Fortè. Everything was great! Thank you for taking the time to gives us great feedback. It is always rewarding to hear when hard work pays off. We were proud to be a part of your special day. I will be sure to share the kind words with our entire team. I wish you and Nel's many more years of happiness. Thank you for taking the time to share your experience with us here at Forte. It was a pleasure working with you both, all the best to you and Joe in the future. If you are looking for a wedding venue, look no further! Nick and his crew, especially Lisa and her wait staff, made our daughters wedding reception absolutely flawless! Start to finish, they were fantastic to work with. I cannot say enough about the confidence we had in knowing they had every detail under control. We had a very large group and not a single complaint. The venue, the food, the hospitality, service and overall professionalism were remarkable! We are so grateful to Nick and Forte for making our daughters wedding the best day ever! Thank you for taking the time to write such a great review. It was a pleasure to be part of Sidney & Derek's special day. Also Thank you for sending over the video of the sparkler send off it was a great way to end the evening. Can't say enough about what a great experience we had with Nic at the Forte while planning our daughter's wedding. We felt very confident we made the right choice throughout the whole process from the day we booked the venue to the day before when we did our final walk through. We had so many compliments from our guests about how delicious the food was and also how smoothly it went to get all of our guests through the buffet. Thanks also to Lisa and the rest of the staff for doing such an awesome job. Lisa easily calmed our nerves when we weren't exactly sure what to expect by taking care of all the details throughout the evening. We had an awesome time! Thank you for taking the time to write this review. It was a pleasure working with all of you. Have a great rest of the summer. Nick was quick, professional, and overall a pleasure to work with. He was flexible and worked with me to make sure everything was ready and in place for my banquet I held there. All the attendees were impressed and the space and service was great! I would recommend this venue to everyone! 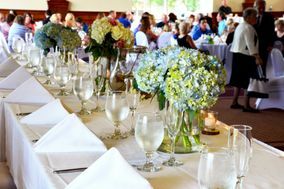 We loved the service and great hospitality we received when they hosted our big event and will certainly look to use them again in the future and would recommend you do the same. We would recommend this venue to anyone looking to have a laid back, but fancy wedding reception. Nick was absolutely the best....very fast responses and willing to go above and beyond to help make the day go smoother! We got many compliments on how good the food was. The staff was very accommodating and willing to help out with any special requests! Thank you so much for making our day so amazing! Our family and friends really liked the food, atmosphere and everything. We recommend Nick Speck, Forte and Baratta’s for a special event. We have used Forte for my husband's unit's dining out for the past two years. They are wonderful and easy to work with. The Army dining out has many traditions and Forte is has been very accommodating for all of our needs. I would highly recommend them!! Thank you Forte!! Nick was great to work with and he did everything in his power to make the event run smoothly. We will definitely be working with Baratta's Forte again in the future. The staff is so easy to work with, make the planning process a breeze! we had a wonderful wedding: nick s. was awesome very professional, very accomodating. i didnt had trouble on everything scheduled appointments. the place was nicely decorated: the food was delicious. we had good feedbacks from our guest. i highly recommend this place for wedding receptions. thank you so much, to nick, and to the crew. me and my husband are trully grateful.